The album is called Outside and tells a story...a gory one. It’s the story of a serial killer who makes art with the bodies of the victims (gag). What’s splendid about the album is that every song is told from the point of view of a different character (the killer, the victim, the PI etc...) and, to me, it’s a story of loneliness. 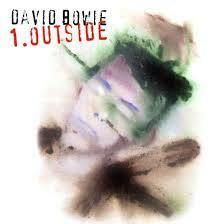 David Bowie was always “outside”, different, a minority. Thanks to his courage and charisma rather than being an outcast he became a leader. He started trends. So here is my favorite song, from the point of view of the prime -innocent- suspect, enjoy!